The Sony Ericsson T616 is very basic when it comes to mobile phones. It weighs only 95 grams, has 128 x 160 color screen with 65k colors, supports GSM 850, 1800, and 1900, built-in digital camera, Bluetooth, Infrared, USB, and can be used as a modem. The Sony Ericsson T616 is available in three colors: Aluminim Haze, Abyss Blue, and Volcanic Red. 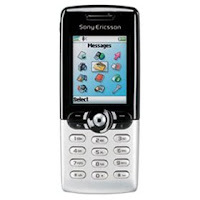 The Sony Ericsson T616 is a sleek and slim candy-bar phone that can fit easily into your pocket. The keypad on the device is spacious and you won't have problems typing. The built-in camera on the Sony Ericsson T616 is not a mega pixel camera but it delivers clear photos. It even has settings to allow you to shoot pictures in black and white, sepia and negative tones. The back of the phone, near the camera has a mirror so you can easily shoot self portraits. Call quality is excellent on this device, maybe unlike other phones, they didn't pack every feature conceivable that the manufacturers forgot that this was a mobile phone. Like I said, since it was released almost 5 years ago, this is a very basic phone. Although the Sony Ericsson T616 has a calendar function, don't expect it to support all day events, just the basic reminder function. And although the housing is sleek, it is a fingerprint magnet. Other than that, I have had no complaints about this phone. I had it for two years before I gave it to my nephew which he sadly lost. If you can find the Sony Ericsson T616 on any store nowadays and you're looking for a no-nonsense mobile phone that doesn't have everything packed into it except your kitchen sink, then this is a pretty sturdy device. It would be good mobile phone for your teeners or yourself.